There are times when self doubt creeps in and I wonder whether I&apos;m capable of being able to heal others. I know this is all part of the journey, and I remind myself it&apos;s not me doing the healing but the Universe working through me. I am but a vessel that allows Universal love and light to flow through me and into someone else. I remind myself to trust in this process, to trust that this happens only for highest good. 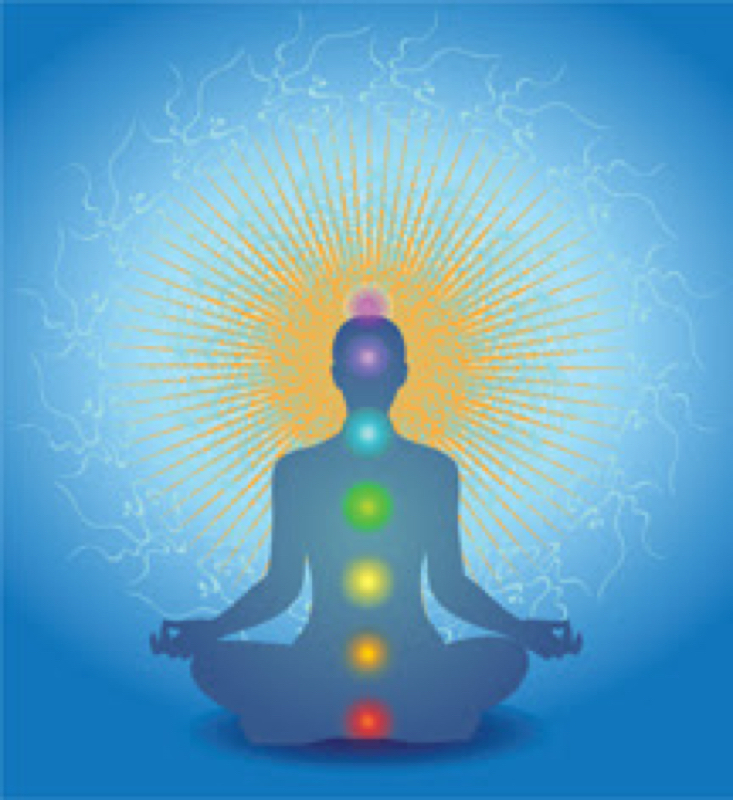 I have a client booked in this week for a Chakra cleanse and balance, Reiki treatment and spiritual guidance. I love that this journey encourages me to help others, to give guidance, to share my experience, to offer messages from Spirit. I truly feel it a privilege. I love that this client is excited (her first ever treatment), and that she may leave with hope and a sense of peace. What a special gift I have been chosen to give to another person. The further along on my journey I venture, the more I am in love with my spirituality. The wider my eyes are opened. The fuller my heart becomes. The more I believe in myself. Shout out to the Universe and the Universe will listen. If you truly want it, behave like it already exists. 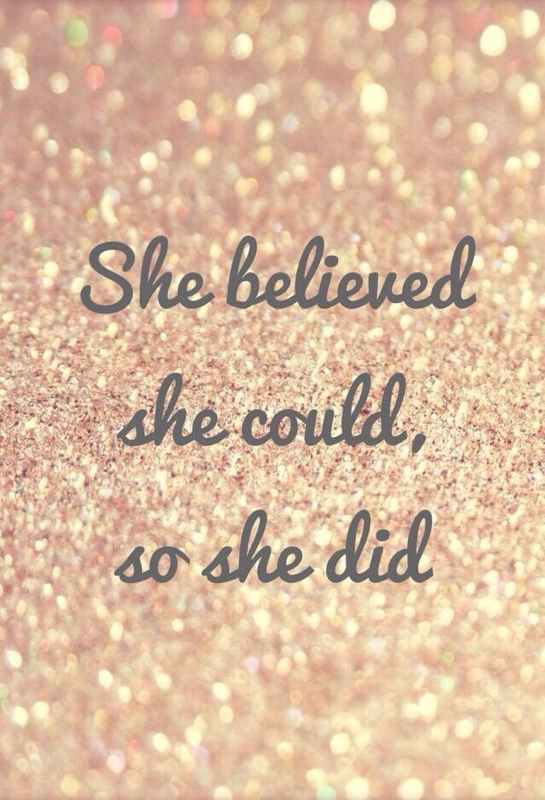 You are capable of anything. Love yourself for who you are in this present moment. You are exactly where you need to be. Set goals, then believe you have already achieved them. Fear is just a state of mind. Fear is only what you create. You can do it. You are doing it. You have done it. You are beautiful. You are successful. You deserve love. YOU ARE LOVE. Nice to meet you and thanks for stopping by and reading my ramblings. Over the past couple of years I have begun a spiritual journey - one of learning, frustrations, surprises, growth and enlightenment. Raised in a Christian environment for most of my life, I like to think I have strong morals and know right from wrong (wrong more often then not when I was younger!! ), but always felt there was a piece of me missing - you know that certain something that nags at the back of your mind but you're not sure what? Yep, that. Religion never sat right with me. I was always the curious one asking questions in RE class during high school, which of course had my RE teacher looking at me like I was a perfect heathen!! I never knew an alternative at that point in time - religion, in my opinion, is built on fear - fear that doesn't allow you to question, doesn't allow you to take your own path, squashes any individuality. Please note: this is simply my opinion and my experience only. I believe that if you follow any religious path, then that is YOUR path and I am truly accepting and tolerant of that - it is just not my path. I have always been curious about the occult, anything supernatural, other religious beliefs (other than Christian), Mother Earth, aliens, spirits, mediumship, etc. However, I didn't realise at the time that I could experience these things first hand, that I could receive guidance from the Universe, from Spirit Guides, from Angels. I didn't believe deep down that these things were anything but fantasy. I had a lot of personal growth to do first before the Universe was ready to show me this amazing path. I can't say there was a particular instance or event that urged me to further explore this, but clearly the Universe decided I was ready. I went to see a Medium, Marg, at my local New Age store one day - totally spontaneously too I might add. I was going in for an Aura photo and she happened to be free so I thought why not? There was an instant connection. I had my reading and at the end she encouraged me to start meditating. I really had very little idea about it all, so she invited me to her weekly meditation group. I went along, and what do you know? It fit perfectly. The group of ladies were all like minded and encouraging and the energies worked beautifully together. That was the start of me connecting to my guides, and receiving messages and guidance. That was about 18 months ago now, and boy have I grown!! Marg has been like a Mentor to me - I would really like to thank her for her ongoing guidance and support, and for answering all my questions (that I'm encouraged to ask!). This path feels like home - everything makes perfect sense to me. I can question things I'm unsure of, ask the Universe and my guides for help and support and for guidance. I can manifest things that I desire (provided it's for my highest good of course!). I have grown so much, but there is still so much growing to do! And I couldn't be happier. I know I'm only at the beginning of my journey spiritually and personally, and I look forward to exploring and learning more every day. Please, feel free to share your experience with me! I want to share with you one of my biggest struggles - not being in control of other people&apos;s actions, and consequently, how they affect my plans, attitude, mood, etc. Sure, I understand the theory. 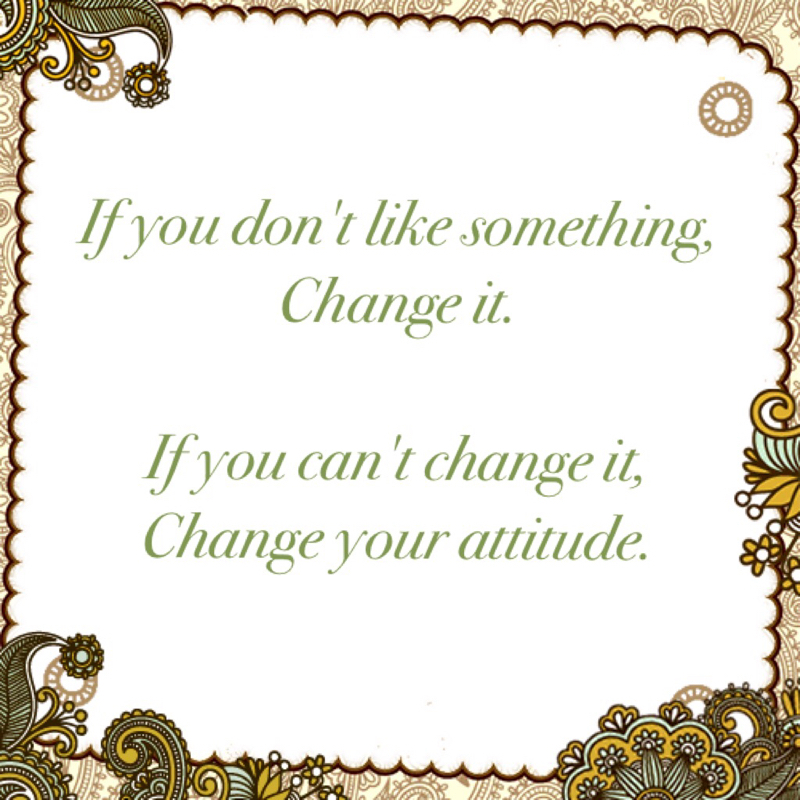 If you can&apos;t change something, then you should change your attitude. And of course it makes perfect sense - because how you feel all comes down to how you choose to feel, regardless of the part someone else has played. I decided to write about this today because of a recurring issue I have in my business. With my furniture upcycling, I often have clients collecting pieces from my home, as this is where I operate from. I try to be flexible and organise a day/time that suits my client best and work around that. The frustration I have is when those clients don&apos;t show up, or message me after the arranged time to reschedule, or to reschedule after committing to picking up their piece two or three days in a row! I suppose it&apos;s because I find this incredibly rude, and presumptuous for the client to think I am a lady of leisure that can sit around all day to wait for them. I do understand that life happens, and there are situations that arise which are beyond control. But it just happens all too often, and it leaves me seething!! It affects my mood, it affects my plans for the day, it affects my budget. And I think to a point it&apos;s okay to feel frustration. But I need to learn to nip it in the bud quickly, and to release it. The question is, how do I do this best? It&apos;s something I&apos;m slowly learning. I am learning that how I feel is how I choose to feel. IT IS A CHOICE -NOT A PREDETERMINED RESPONSE. There is no need to carry someone else&apos;s weight. If you&apos;re holding onto something that isn&apos;t yours, release it right now. Live the best version of yourself. Be responsible for your own actions and feelings, not someone else&apos;s.
Namaste. My name is Jessie Jean and I am sharing my journey of spiritual growth with you. I am also a wife, mother, creative, and believer in universal energy and power.